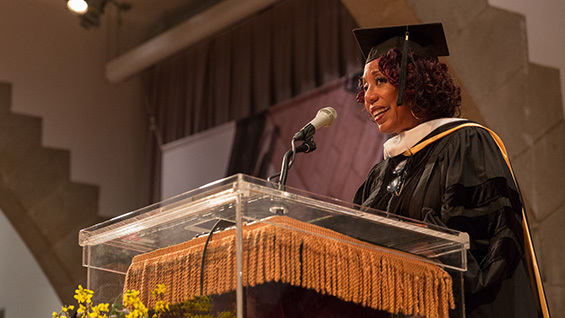 On May 24, 2016 Denise Young Smith, vice president of worldwide human resources at Apple, Inc., delivered the commencement address to the 157th graduating class of The Cooper Union. Below is the text of her address. President Mea, thank you for that kind introduction. Thank you, everyone, for this wonderful honor, and for welcoming me into The Cooper Union family. To our graduates, proud parents, grandparents, family members, distinguished faculty and staff… I am thrilled to be here with you today. And it’s a little humbling, to be honest…to stand in this Great Hall, at this podium where our country's most important leaders have spoken for more than a century. Frederick Douglass. Susan B. Anthony. Abraham Lincoln… so many others. Not only have great words been spoken here – minds and hearts have changed here. The course of history has changed here. So many profound visions have been articulated in this room…so many declarations have shaped the course of our world. As I stand here, in this Great Hall, at this great podium, I realize in full what Steve meant. And I think I realize what Peter Cooper intended. We’ve always been at our best side by side with artists, poets, designers and thinkers sitting at the crossroads of technology and humanities. I like to think that Mr. Douglass and Ms. Anthony and President Lincoln and others would be glad to see today, that because of their lives and their work, a woman who looks like me was able to have the opportunities I’ve been so fortunate to have…and to be invited to speak to students like you. Their lives and work, 150 years ago, secured the path for all of us here this morning to stand together and represent the full spectrum of the rich and beautifully diverse world we live in today. We're certainly still working on the same things as Mr. Cooper and the telegraph… ways to communicate and connect us. I’m not sure how I would explain the iPhone or the Apple Watch or Apple’s ecosystem to Frederick Douglass or Susan B. Anthony. I can only imagine what their favorite Apps might be… I am certain however that they’d understand and embrace our passion at Apple for changing lives, leaving things better and doing our life’s best work. Now, I don’t expect you to remember every word I say here today. But I do hope you remember everything this day represents… the culmination of your years of hard work. Your today is an accomplishment that young men and women around the world dream of and strive for: the chance to get an education… to advance… to excel… to live an enlightened life. Today, you receive a degree that commemorates the rigorous and challenging education you received here at Cooper Union. You should be proud of everything that signifies. And you should be especially proud that today, you aren't just receiving a diploma. You’re inheriting the powerful legacy of Peter Cooper. Peter Cooper’s legacy is founded in a vision: that education, at its best, can elevate and enlighten our entire society. From the very beginning, this school recognized that education can — and must — be about more than memorizing facts and dates and statistics. It’s about engaging with ideas, even the ones that are sometimes difficult or unpopular. A university like this is a place to challenge ourselves, and our nation, our world to be better. From the beginning, this institution led by example. It was inclusive and accessible to everyone. Women. Native Americans. African Americans… at a time when that was rare, unheard of and even illegal. It might be hard for us today to understand just how radical that was. But it set this institution apart — and set the example for the rest of the academic world. That vision was so important — and still is today. Because when more people are able to get a first-rate education — when they are empowered to do what we at Apple call our life’s very best work — the whole world benefits. What is life’s very best work? Of course, it’s different for everyone. You do your life’s best work when your strongest skills meet your deepest beliefs. When you get to do what drives you… and what you’re really, really good at. When your opportunities unite your purpose and your passion. It’s that wonderful moment when you’re called to a mission that absorbs you completely… and when you know, in that instant, there’s nowhere you’d rather be. Your life’s very best work isn’t something you find at the end of your career. It’s not a payoff for years of service, it is a collection of experiences throughout your life. It’s something you do not have to wait for — you can start now — because a long arc of a career isn’t promised to anyone. Even tomorrow is not promised to anyone. What you can do, in each and every moment, is ensure that you’re doing the best work you can possibly do — in your job and your life. Because with each moment that passes, you define yourself. So today, as you prepare to become graduates, here’s my question for you: What is your life’s very best work? And, just as important, how are you going to achieve it? The first thing you must realize is that you can’t do your life’s best work until you find your true, authentic self. And that doesn’t usually happen right away. President Mea mentioned that I’m a musician. And it’s true: for as long as I can remember, I’ve loved music and I’ve loved to sing. I remember growing up in my home in Colorado Springs, about 7 years old sitting in my bedroom day after day, listening to Aretha Franklin records. And if you’ve never done that by the way, sit in your room, sipping Coke through a straw and listening to Aretha… well, I’d highly recommend it. Whatever you call it, Aretha has that wail that just sounds like nothing else. I really wanted to be able to sing like that…like Aretha…to have that “wail”. But no matter how hard I tried, I could never really do it. Something about my voice was just… different. I was so disappointed I would try, again and again, to sound like her until I strained my vocal cords… and still, I couldn't get there. But then here’s what happened: I landed somewhere else. The place I was actually supposed to be. It was when I relaxed — became myself and moved away from trying to be Aretha — that I discovered that I couldn't be her for a simple reason: I wasn’t. And actually, that was okay. That was really okay. Because I discovered that I had another kind of voice — one that eventually got me to Carnegie Hall: an operatic soprano voice. It wasn’t Aretha’s voice. But for me, it was something better. It was my own. That was an important journey of discovery for me. To realize that if I wanted to advance in what I loved, I had to settle into who I really was. And when you discover who you are, it’s, of course, not settling at all. It’s a wonderful realization. We each have our own unique voice — something that no one else has. And if you embrace it, you have a chance to make an impact that is all your own. As I came to understand this about my singing, I realized that this is pretty close to what I do in my day to day work, and in my broader life. By my own count, I’ve interviewed thousands of people over the course of my career. When I sit on the other side of that table, the most important thing I try to figure out is who they uniquely, truly are. I look for the light in their eyes. When I coach or counsel someone on finding their exact right place in our organization, it’s also about helping them become comfortable in their own true selves. In their own way, each of them is finding their authentic voice. And I’m lucky to work somewhere that wants to hear that voice expressed. Apple wants you to be your best self, but we also want you to be yourself. The fact is, we each have a blueprint of who we are pretty early in life. Hopefully we expand, grow, flourish. But essentially, we are largely who we are, early in life. The saying goes “where you go there you are” and the sooner you revel in the truth of that — embrace the power of that — the sooner you’ll be able to do your life’s best work. Because when the right person finds the right role… when they find the perfect match between their talents and their responsibilities… they’re unstoppable. I’ve seen far too many people try to shoehorn themselves into others’ expectations — their parents’ expectations, their school’s expectations, society’s expectations. And I’ll tell you, if you try to be something you’re not, we can’t help you… you can’t help you. Sometimes when we haven’t given things enough thought and reflection, we become willing to force ourselves into a path that just doesn't match our hearts desire. It’s one thing to challenge yourself and stretch beyond your comfort zone — that’s a good thing. It’s another thing to contort who you are — into who you are not. And to follow the course of someone else’s path they may have set for you, perhaps for good reasons…but they aren’t your reasons. So it’s important to ask, every time you apply for a job, move to a new place, push for a promotion, whether it’s what you want, and where you really belong. If you’re being honest with yourself, is this truly where you want to be? Is this a place where you can be you? No one is a good fit for every job, every relationship, or every situation — and that’s okay. The important thing is learning when to say no — and actually being able to say no. Turning away from an opportunity that’s not right is not a failure. It’s a success. Because even if you managed to stay in that role for your entire career, the fit would never have been quite right. And somewhere, deep down, you’d know it. If you never embrace your whole and true self, your voice and your expectations, you’re going to spend your precious time doing someone else’s life’s very best work. And no one should want that. Careers look very different in the 21st century. There are far more options, more choices, more paths to consider. Data scientists, mobile apps developers, chief digital officers only recently came into existence. But humanity doesn't change. There are elements of the human condition that remain consistent, century after century. Knowing this will serve you well in your career, and in life. I already know you now how to work hard and great news you’ll need to continue doing so. But actually? Much of what you need to know for your future is grounded in the same lessons you learned as a kid, watching Sesame Street. Can you collaborate well with others? Do you treat people with kindness, respect, and humility? How well can you demonstrate empathy and connection to others? Will you exercise creativity, critical thinking alongside just plain good judgment? Can you share? Do you listen? You see, there’s a reason why people like Big Bird. And there’s also a reason that, when you look at the course listing in Apple’s internal training program, Apple University, none of them are actually about hard skills, like coding. They all focus on areas like culture, collaboration, and understanding the essence of creativity and innovation. Because ultimately, these are the skills you need for sustained success. Truth. Authenticity. Joy. Empathy. Compassion. The ability to serve. To move the human spirit. To include. To create a sense of belonging for others. There aren’t nice to have morals attributes from our aunts and grandmothers. These will prove to be the core strengths of the exciting, complex, globally interconnected, multicultural, multiethnic, dynamic world you’ll each be a vital part of. After that, there’s just one more essential step to doing your life’s best work. You need to find a place where you can put it all into practice. You need to find a job, an opportunity, an experience, an organization, a life calling that reflects your passion, your purpose, and your values. And then you need to bring your whole self to that place, every single day. Remember that it is in the course of each day that our stories are ultimately told. I know this is possible, because for almost the last twenty years I’ve been fortunate to find it in my own life. In Apple, I found a company that embraces uniqueness and difference into our culture, because we know that’s how innovation thrives. I found a company with values… where every person I work with believes deeply, passionately in leaving the world better than we found it. Above all, I found a place where my unique talents met a mission I believed in. A career where I get to express my passion. Whatever it is, it will be entirely your own. And my wish for you today is that you find the courage… and find a place… to express it every day. Because in that day to day, that path, that journey that is what enables you to do your life’s best work. Maybe you won’t even have to look very far. If you stand in your true authentic self… if you are honest, gracious, empathetic, and kind… you will find it. It will find you. And you will be successful as you uniquely define it. Graduates, when you leave this room today, take Peter Cooper’s vision with you. It’s a calling, a legacy, a responsibility… and it’s now been passed to you. It’s your job to preserve this work — and strengthen it with your own. It will take effort. You are used to that. It will take your very best work. Your life’s best work… And I have no doubt that you are up to the task. Thank you very much. And congratulations, Class of 2016!